I thought I would publish this blog post while I’m away at my ordination retreat in case you’re missing me during my social media blackout! I am so blessed to have such a creative father, he has very lovingly designed and made my ordination stole for me. 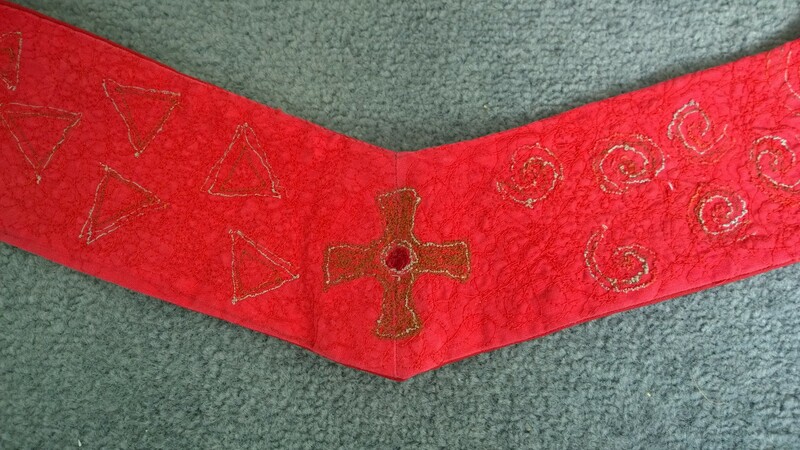 In fact, he ended up making me two – we first expected that the stole would need to be red (as it has been in Durham for some years) so he made me a red one. Then I discovered that the stoles this year will be white at Durham, so this gave Dad the opportunity to build on what he learnt making the red one! I wanted my stole to represent something related to St Hild of Whitby who has become a bit of a patron to me during my vocation journey. I have written before about what she means to me. One of the symbols of Hild is the ammonite – this is related to a legend that she turned a plague of snakes to stone (much like St Patrick is said to have banished snakes from Ireland). Rather enterprising locals began selling ammonites as souvenirs carving snake heads onto them, saying that they were proof of Hild’s miracle! Ammonites also fascinate me as they naturally contains the mysterious Fibonacci sequence which relates to the golden ratio – so, for me, it’s a wonderful symbol of the beauty of creation. In addition to that, they are also a spiral pattern. Spiral patterns have appeared on ancient stones in Britain and are one of the earliest religious symbols. I recently found out that St Michael’s, the church in which I will be serving my title as curate, is on the site of some kind of stone circle indicating that it has been a site of worship since the time of Abraham! So, in a sense, the spiral ammonites are a nod to the prehistoric and celtic roots of St Michael’s as well. At the nape of the stole is a St Cuthbert Cross – this is a nod to Durham Cathedral where I will be ordained and which is the shrine of St Cuthbert – another saint who is dear to me. 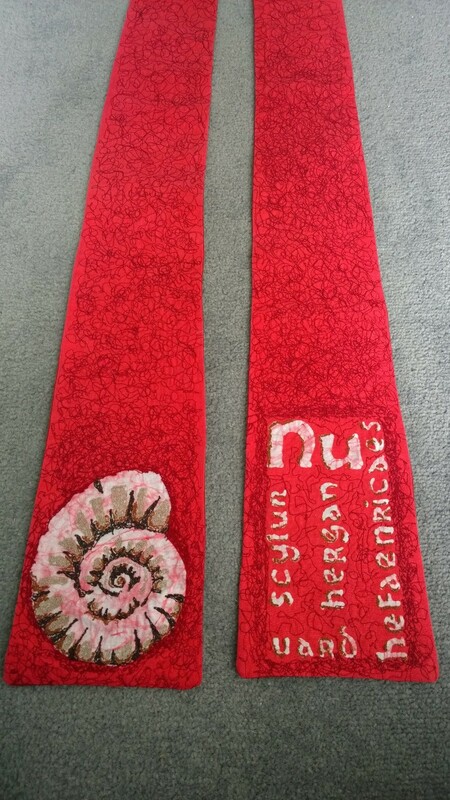 The stole is machine embroidered. The patterns recall for me the foam of the sea. 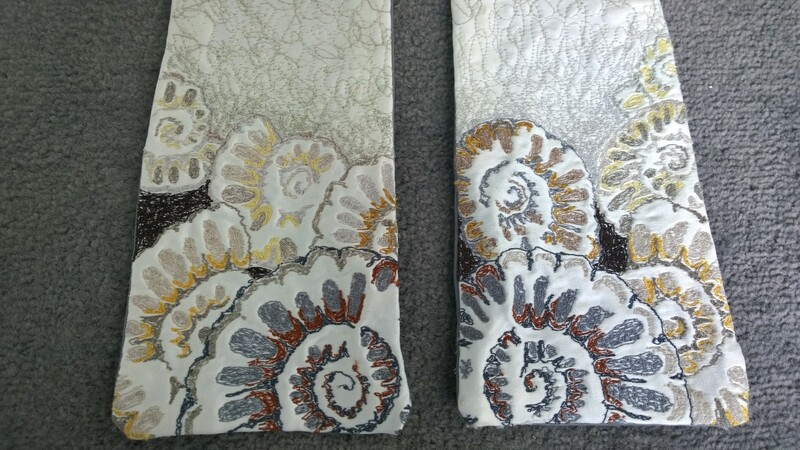 A close up of the ammonite design. You can hear the hymn read in Old English in this video. 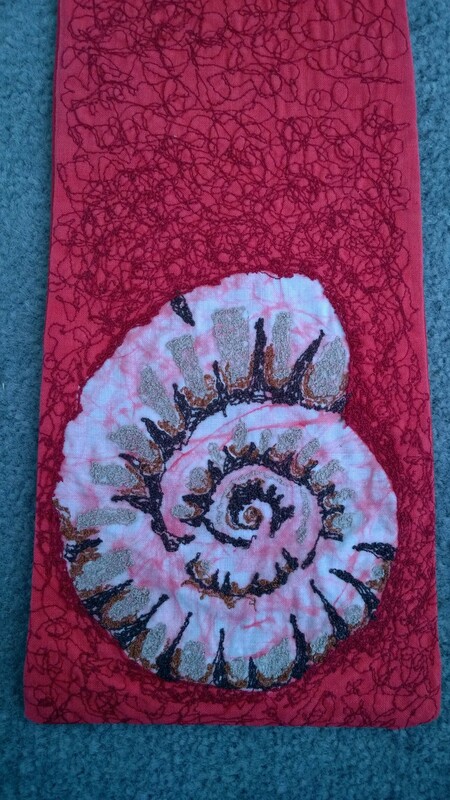 This ammonite was created by batik and embroidery. This is the first line of Caedmon’s hymn of praise to the creator in Old English (preserved for us by the Venerable Bede). 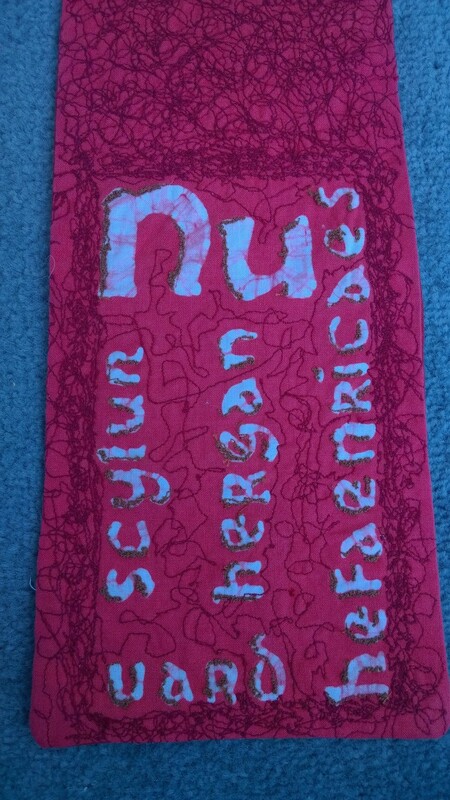 This was created in batik and embroidered. The spirals again recall the ammonites, the triangles represent the Holy Trinity. The cross is the cross of St Cuthbert. 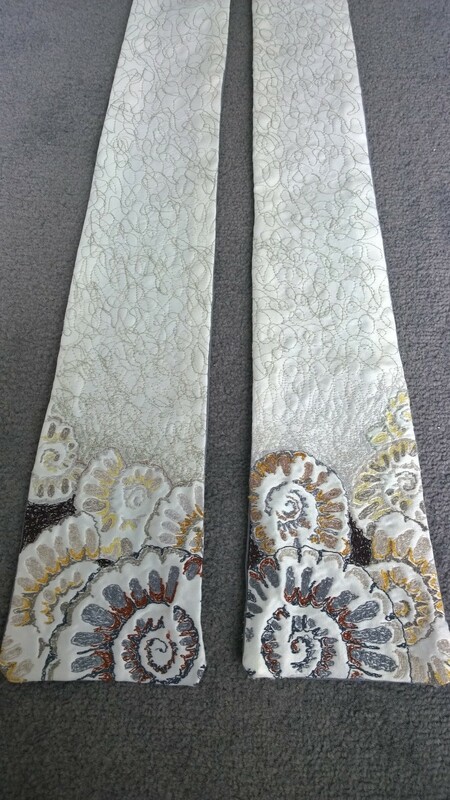 A massive thank you to my dad, Andrew Hall, for creating these beautiful stoles for me to wear.